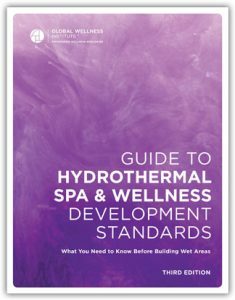 A resource by the Hydrothermal Initiative, The Guide to Hydrothermal Spa & Wellness Development Standards was created to provide design and building guidelines for hydrothermal areas (also known as “wet areas”) in spas and private residences. Hydrothermal bathing (including saunas, hamams, steam rooms, hydrotherapy pools, etc. ), with its benefits of cleansing, detoxifying and improving the immune system, dates back thousands of years and is one of the most ancient spa practices.